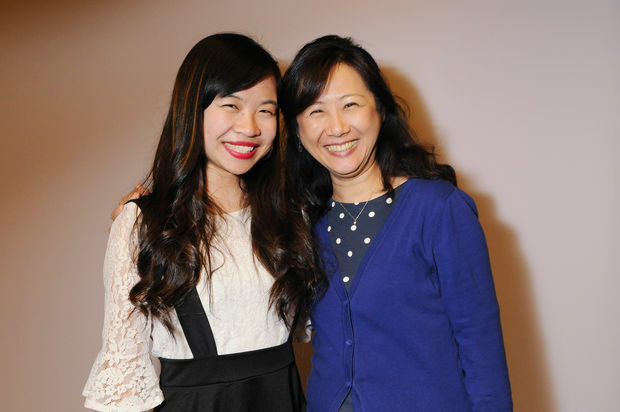 Sophia Qu with her biology teacher, Dr. Meng-Ping Tu, at her scholarship awards dinner last week. FLUSHING — Sophia Qu has always been interested in science, but it was a high school biology teacher that helped steer her toward research, she said. “I first became interested [in animal studies] in sophomore year,” she said. She took a zoology class at Stuyvesant High School taught by Dr. Meng-Ping Tu, who encouraged her interest and pushed her toward the research component of the field. She's spent the past two years at the American Museum of Natural History, interning with researchers after school. Her after-school work paid off: She’s headed to Cornell University in the fall, with help from The Albert Shanker Fund scholarship from the United Federation of Teachers. Qu, like many of the other 180 scholarship winners, will be the first in her family to go to college. Her parents came to Queens from China in 2000, but they sent her back to China until she was 4 so she could live with her grandparents while they saved money. She excelled early in school, but also had to make a lot of decisions on her own. “My parents don’t speak English well, and the whole process of going to high school, I was more independent,” she said. Her teachers and guidance counselor filled in when her parents couldn’t — steering her toward scholarships and internships. “Teachers work tirelessly to provide every student with the opportunity to achieve their dreams,” UFT President Michael Mulgrew said in a statement. The scholarship, named for the UFT’s founder, himself a child of immigrants, has given out more than $45 million in scholarships since it was founded in 1969. For Qu, the money provides an added financial security as she pursues her future. After meeting other recipients at the awards dinner last week, she felt more eager than ever to move forward with her field of study.